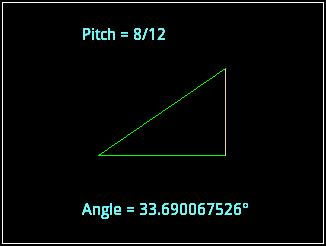 The program PITCH calculates the pitch and angle of various roof heights. The pitch of a roof is the number of inches of vertical rise per 12 inches. For example: a roof of 3/12 is pitch is a roof that rises 3 inches for every 12 horizontal inches. 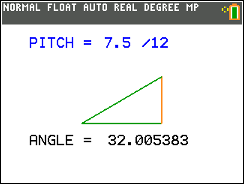 This program demonstrates the angle computer given different roof pitches. You control the rise, anywhere for 0.5 ft to 12 ft. Use the up and down arrow keys to control the rise. TI-84 Plus CE: Press [CLEAR]. Update & HHC 2016 Highlights to come! I have returned from Colorado attending the HHC 2016 conferences. The weekend went by way too fast! Highlights are going to come later this week. But when it's completed, it looks like you forgot to restore it back. So I would suggest after the REPEAT/UNTIL loop to add a little "HAngle:=a;" to place back the angle mode of the calculator like it was.